101. Those cheating Lewis kids! #101. Those cheating Lewis kids! This moment isn't funny in a "ha ha" way. It's more of a quiet kind of funny. Or maybe it's just funny irony. I don't know. All I know is that I had to include it on the list. Because what are the odds that a brother and sister would exit the game in the exact same way? 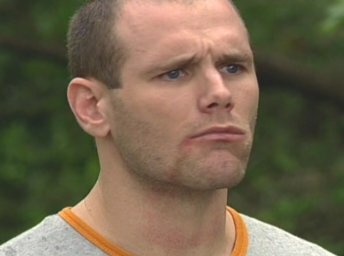 One of the best moments of every Survivor season is when the players' loved ones come out to the island. It usually happens late in the season, it's a very emotional episode, and we've had some very memorable moments happen in these loved one visits. 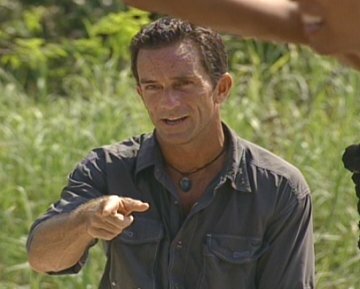 In fact, one of my favorites happened to take place during Survivor: All-Stars. 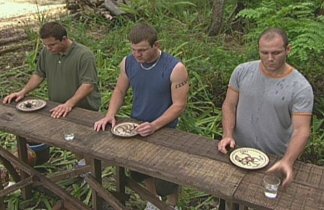 Episode 13 was the famous "loved ones" visit in All-Stars, and the challenge in this episode was that the players' loved ones had to eat pieces of gross food in order to spend a night on the island. Tom's son was there, Rupert's wife was there, etc., but the highlight for me was what happened to Jenna Lewis's brother (Jai) in round four. Because Jai Lewis became the first loved one ever to be eliminated from Survivor for cheating. You see, the entire point of the challenge was that the loved ones had to eat increasingly disgusting pieces of gross food. If they downed one item fast enough, they moved on to the next round. And so on and so on, until only one loved one had won the reward. The loved ones did have a cup of water they could drink from, but only after they had finished their item and Jeff had given them the okay. Jeff had explained this rule to the loved ones at the start and everybody seemed okay with it. At least... until round four. Round four required the loved ones to eat a giant tarantula. And Jai started off strong. He happily popped the tarantula in his mouth... before he forgot the rules for a moment and accidentally took a sip of water. You can see in the screen caps below. Jai reaches for his cup, he takes a sip of water, and Jeff busts him for it. Jeff says that Jai is disqualified for drinking water and Jai obviously disagrees. He gets a look on his face like "You never told us that!" and Jeff gently reminds him that he did. So Jai has to leave the game and it's clear that he's pretty pissed about the whole thing. He does not agree with this ruling at all. But really... he shouldn't have felt that bad. Because the exact same thing happened to his sister just two episodes later. Part two of the Lewis-Probst feud happens during the finale. We're down to the final three and it's now time for the dreaded "Hands on the Immunity Idol" challenge. Jenna, Amber and Rob are standing on raised poles in the water, and they must keep one hand on the idol for as long as they can. 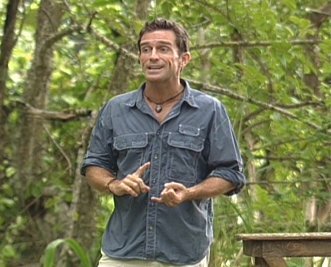 It's the single most important moment of the game, and a million dollars is at stake for whoever can stand there the longest to win immunity. It's a very, very tense moment in the game. Jeff Probst is sitting there watching as the challenge goes on, and he notices that Jenna is shifting her back foot around a lot because she has a cramp. So he has a really good vantage point when she suddenly lifts her back foot for just a second. It was just a quick movement, but it was enough for Jeff and he disqualifies her from the challenge for lifting her foot. Of course (per Lewis family tradition) Jenna obviously doesn't believe him. She stands there for a few moments in silent protest, then jumps off the platform in a huff. It's clear that she doesn't agree with Jeff's ruling. 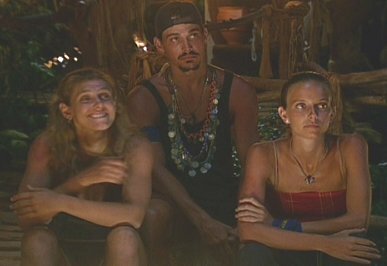 In fact, Jenna is still angry at Jeff later that night, when she snips at him at Tribal Council that she doesn't think she lifted her foot. Jeff says that "it was subtle" and it's clear that Jenna is still pissed off at him. "Oh I bet it was subtle," she says with a smile. And she immediately starts filing the lawsuit against the show in her head. "Yeah, I bet it was subtle." Like I said this wasn't the biggest "ha ha" moment on the list but you have to get a chuckle out of the irony of it all. I mean, seriously, both Lewis kids got dragged off the island kicking and screaming over something they claimed they didn't do. In fact, I wonder if there was a family full of Lewises waiting for Jeff when he got back to the mainland. Do you think they followed him home and yelled at him after the taping of the finale? And can you imagine what it must have been like when Jenna and Jai played board games against each other when they were kids? Someone literally would have been punched in the face! Did either one of them ever end up with a Monopoly piece embedded in their skull over a failed real estate transaction? Anyway, note to self: Don't play basketball against either one of the Lewis kids. They cheat. And they get pissed if you try to call them on it. P.S. The second funniest part of this moment? It's when the producers inserted a quick "Jenna lifts her foot" shot into the finale just so they wouldn't get sued. Yeah, sure, like the camera was right there six inches from her foot when it happened. Whatever. P.P.S. Jenna should have won All-Stars because, sure, she lifted her foot and all, but she also didn't lift her foot, too.